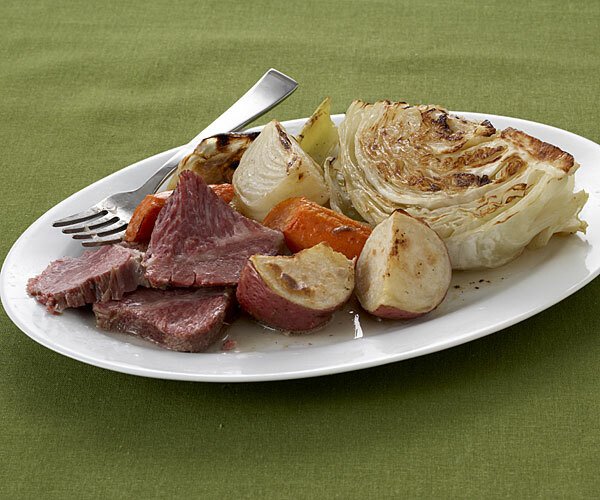 In this take on the classic Irish-American boiled dinner, the vegetables are drizzled with garlic butter and broiled for added flavor. Pickling spice is a blend of cardamom, bay leaves, ginger, peppercorns, and other flavorings; look for it in the spice aisle of your grocery store. Cut a 5-inch square of cheese cloth and lay it on a flat work surface. Put 4 of the garlic cloves, the thyme, pickling spice, bay leaves, and peppercorns in the center of the cloth. Tie the opposite corners together, creating a pouch. Put the brisket and the spice pouch in a 12-quart stock pot and add enough cold water to cover the brisket by 4 inches. Bring to a boil over high heat and then reduce the heat to maintain a simmer, cover, and cook until the beef is nearly fork-tender, about 3-1/2 hours. Add the potatoes, carrots, onions, celery, and cabbage. Simmer until the meat is fork-tender and the vegetables are just tender, about 30 minutes more. With tongs, transfer the meat to a cutting board, tent with foil, and let rest for 15 minutes. Using a wire skimmer or slotted spoon, transfer the vegetables to a foil-lined baking sheet. Reserve the cooking liquid and discard the spice pouch. In a 1-quart saucepan, melt the butter over medium-low heat and add the remaining garlic clove. Cook until the garlic is lightly browned, about 5 minutes. Discard the garlic. Meanwhile, position a rack in the center of the oven and heat the broiler on high. Drizzle the butter over the vegetables and broil until lightly browned, about 5 minutes. Slice the corned beef and arrange on a serving platter, surrounded by the vegetables. Drizzle some of the cooking liquid over the meat and pass the remaining liquid and malt vinegar (if using) on the side. Serve hot.